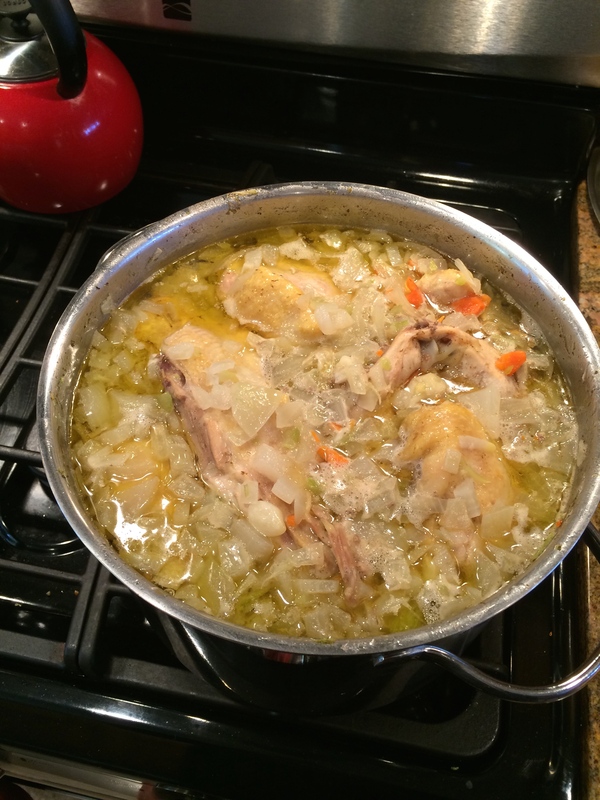 No Salt Chicken Stock – Healthy, EZ, Yummy! 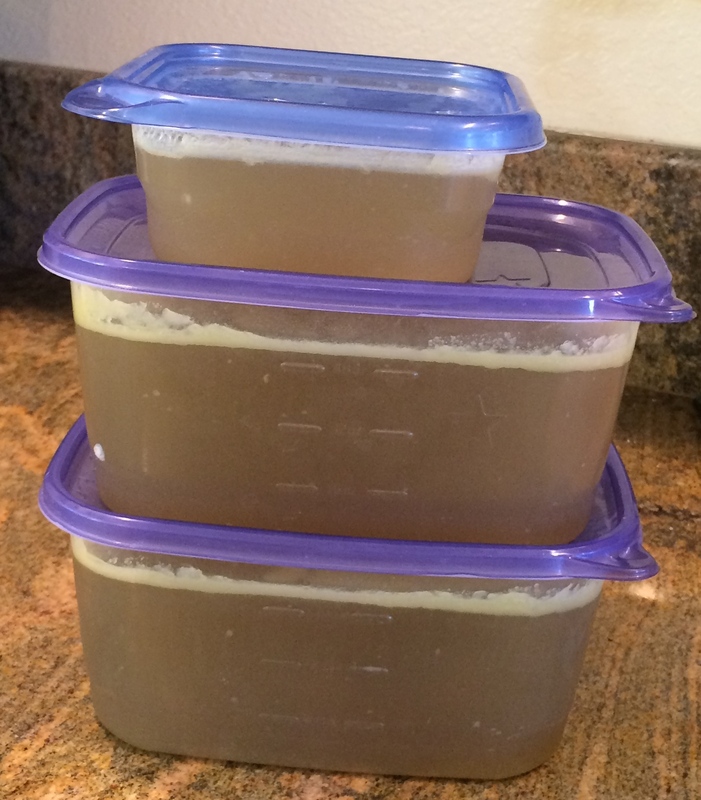 Since realizing it is impossible to use store-bought chicken stock/broth when cooking for someone on a potassium-restricted diet, I have been planning on finding an easy homemade low salt, low potassium chicken stock recipe. Here it is! I adapted it slightly from the Basic Chicken Stock recipe I found on seriouseats.com. I like this recipe because it has NO SALT added. When you use it as a base for soups or other recipes, you can add your seasonings to taste, which is a much healthier way to go about it than incorporating the salt- and potassium-laden stocks and broths they sell in the grocery store. It freezes easily so you can always have some on hand. And it’s just not very hard to make: chop, cook, cool, freeze. I think you will find you don’t mind taking a couple hours to throw this stock together and tuck it away in your freezer as a healthy base for soups, stews, pot pies, etc. Use a sharp knife or a food processor to chop the vegetables. Combine chicken, water, onions, celery, garlic in a large stockpot and bring to a simmer over med low heat. Lower heat, maintaining a very gentle simmer, and cook for 1 hour 30 minutes. Strain stock through a colander or a mesh strainer. I placed another large soup pot in the sink, placed a colander on top of it, and then poured the stock through the colander so the stock ended up in the other pot and the colander caught the meat and vegetables. Fill your sink with an inch or so of ice water and set the pot down into the ice water to cool. (Fill sink with more ice than water. Test before you let go! to make sure the pot is stable and will not fall over.) Allow stock to cool. Pour cooled stock into containers with lids and refrigerate until completely chilled, about 6 hours. Once stock is chilled, skim off and remove any fat or scum from the surface. Refrigerate for up to 5 days or freeze for up to 6 months. Use in any recipe calling for unsalted chicken stock. Throw away the skin, bones, and vegetables. Chicken meat can be used in recipes calling for cooked chicken; the flavor of this chicken is somewhat diminished because most of the flavor has cooked out into the broth; the best use of the chicken meat is in a soup or stew. Freeze meat if you do not use it immediately. 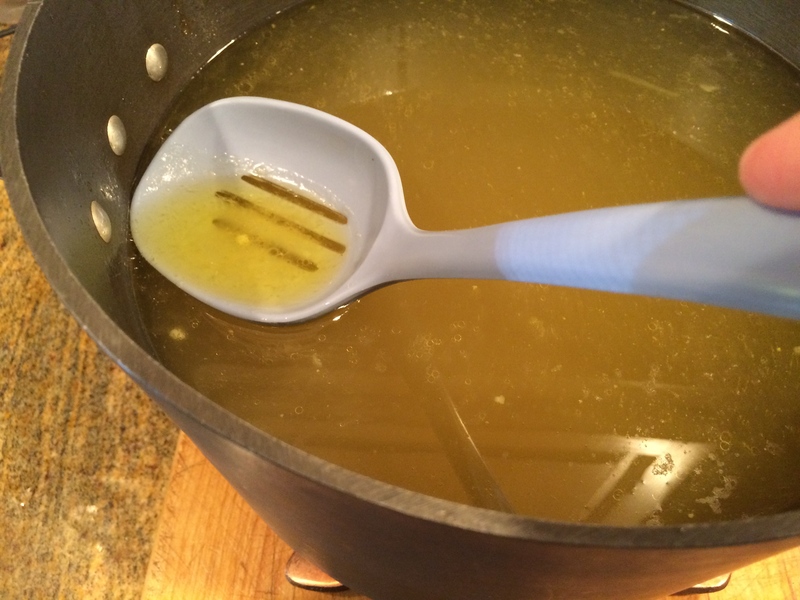 Pingback: Homemade (Low Salt) Chicken Noodle Soup – Healthy, EZ, Yummy! Pingback: Lemon Garlic Chicken Pasta | Healthy, EZ, Yummy! 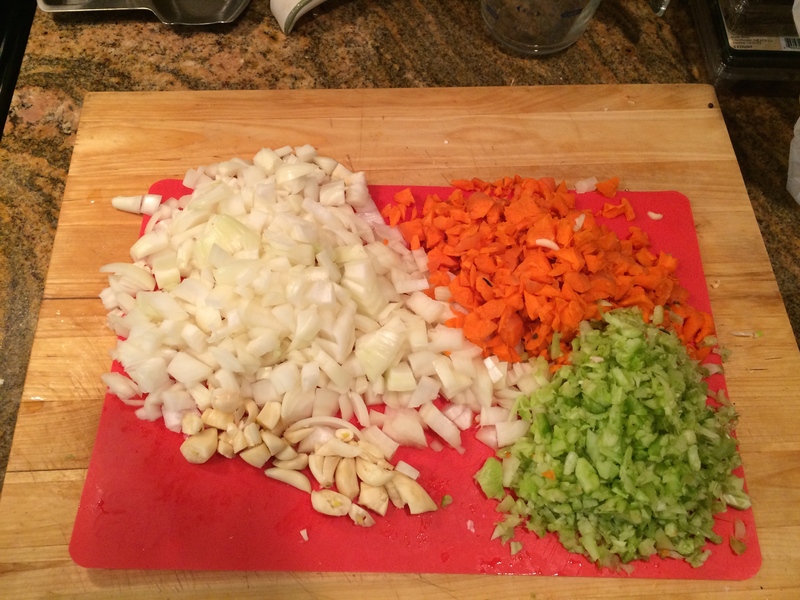 Pingback: Spanish Rice | Healthy, EZ, Yummy! Pingback: Like Mom Used to Make: Bread Stuffing | Healthy, EZ, Yummy! 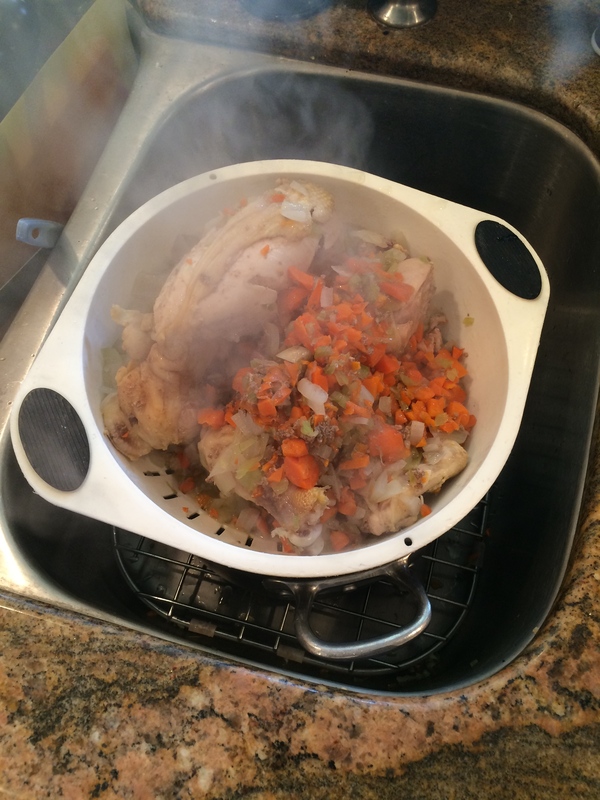 Pingback: Roast Turkey with Stuffing | Healthy, EZ, Yummy! Pingback: Cream of Chicken Soup | Healthy, EZ, Yummy!